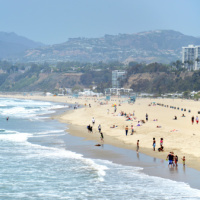 Holidaymakers can now directly fly out from a non-London British airport to Los Angeles for the first time, according to Thomas Cook. The travel firm launched the new twice-weekly route out of Manchester on Monday (May 2) with the help of Saturday Kitchen cook James Martin. Tourists can fly there and back on Mondays or Saturdays from under £400 in economy class and below £700 in premium. Martin was on the maiden flight, trying out some new concoctions as Thomas Cook's official in-flight meal supplier. He and his creative crew tested out the taste buds with his brand new menu at 35,000ft. Martin had earlier posed for publicity photographs with a model dressed up as the late iconic actress Marilyn Monroe. Whatever a passenger's in-flight menu, they can be left with indigestion if they do not take out the necessary precautions to ensure a hassle-free flight. Travel insurance can protect them against lost travel documents, including left-behind passports. LA-bound tourists are spoilt for choice when it comes to attractions in the west coast city. As well as sumptuous beaches, such as Santa Monica and its amazing pier, they can spend a fantastic day enjoying film tourism at Universal Studios Hollywood. Plus there's the world-famous Hollywood Walk of Fame, Hollywood Boulevard, the Hollywood Bowl and Madame Tussauds Hollywood. Non-Hollywood gems include Disneyland, the Museum of Contemporary Art and the eye-opening Griffith Observatory. Stephen Turner, Manchester Airport's commercial director, says the new service offers its 23.5 million customers each year an easy route to America's west coast. Christoph Debus, Thomas Cook's chief officer for hotels as well as airlines, says it has poured £100 million into making its planes' interiors better. He also says Martin's revised menu and its long-haul carriers are "stunning" new features for Thomas Cook customers taking this journey. Passengers' return economy fares begin at £399.98, while premium flyers will be charged from £699.99.